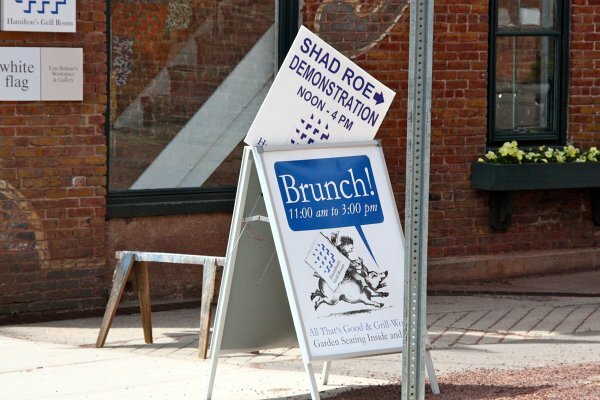 Lambertville held its 29th annual Shad Festival this weekend, ostensibly to celebrate the start of local shad fishing in the Delaware River, though, like most festivals, it’s really a time for people to come together to eat street food—some shad, but also lots of fried things, sausages and peppers, and lots of cotton candy and New Jersey ice—to drink beer from the local brewery, and to shop around the craft tents. 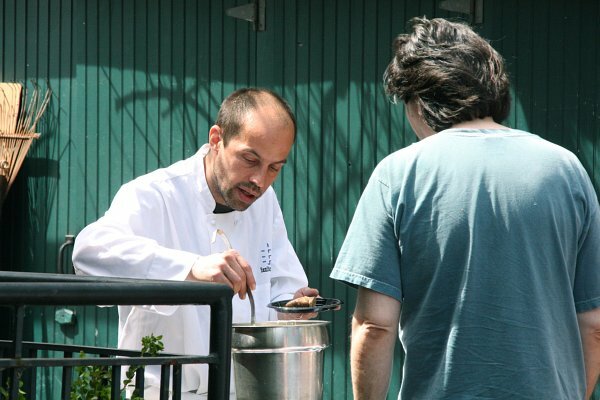 Mark Miller from Hamilton’s Grill Room did a shad roe demonstration that had people lined up all the way down the driveway of the “Porkyard”. Jim Hamilton, a long time resident of Lambertville, and owner of Hamilton’s Grill Room, is locally known as an avid fisherman, so shad roe cooked by his executive chef was certainly the best way to taste the celebrated fish at this year’s festival. Saturday was the day to be at Shadfest, with the sun shining and the temperatures perfect. Happy faces filled the streets, from North Union and down to Lambert Lane. There was a lot going on at the Kindle Cafe tent; they had vegan chocolate chip cookies that in all fairness were very tasty, even for a strict butter-lover like me, and vegan wraps filled with tender black beans and nut-butter creams that didn’t make you miss the meat. Kindle Cafe has been a hot foodie topic in Lambertville lately, with lots of buzz about their underground supper club, where people bring their own and meet to share a vegetarian meal with sustainably sourced ingredients. After trying the wrap, I’m really interested to check it out. Riverhorse Brewery was another hot spot. Riverhorse brews were flowing, food was grilling, and bands playing, and everyone was taking full advantage of the pint-glass deals. The brewery warehouse was loud and musty and full of boozy, laughing people. Exactly what a good Shadfest party is all about.